it's my girls' world: New Year, New You... or Me?! Happy Back to School Monday, lovelies! 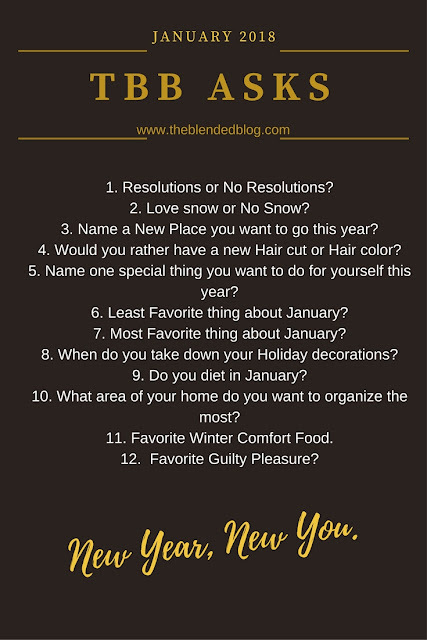 But like the little engine that could, chug on we must and here are just a few January questions being answered from some lovely ladies at The Blended Blog. Absolutely, both for my kids and myself but that deserves a post all on it's own so come back Wednesday! I love snow at Christmas and when I've got no place to go. Snow driving- no fun! I'd like to visit some place new in Canada. We always hightail it out of the country when we can but this year, I'd also like to keep some stuff local. Love both but a new hair cut makes me feel like I've lost five pounds! I'd like to continue with my yoga practice. I started hot yoga last year and try to do it twice a weeks. I've come to fall in love with the practice. January 6th but it's the 8th and my house is a wreck right now as I want to clear out the decoration storage room a bit before I pack back some more. Yes, yes and yes! Or at least eat more veggies and fruit to begin and slowly phase the sugar out. So much areas to organise but I'm thinking a few key cupboards in our house. I love yummy winter soups. Oh, girl!!! Great answer for #12. Why didn't I think of that? I guess because I don't feel guilty watching it. I love Bachelor and Bachelorette so much. In fact, it is on right now and I am blog reading during the commercials. Good stuff. Baha ha ha! That last one left me laughing so hard. That is one show that I personally never got into, but I promise I don't judge those who do. I can't believe the snow you guys have had!!! Yesterday I started organizing one of my cabinets and the shelves all fell down! crazy! Hope your birthday this month is fabulous! Yes, to the soups and no to driving in snow. Love snow but I agree with not driving in it. Hope your year is off to a bang!